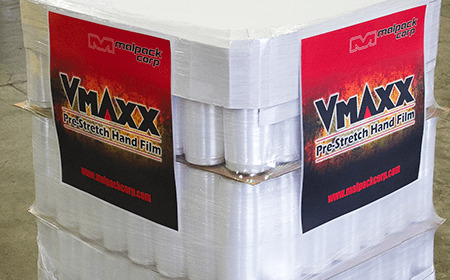 V-Maxx Pre-Stretch Hand film utilizes our proprietary process to produce an ultra-thin hand film that will outperform standard gauge films in puncture and tear resistance while maintaining ultra thin gauges. Vmaxx is light weight making it a manageable film yet firm for an optimal hold on your product. Call today for information on all our pallet wrapping solutions!